When Janice Hatfield, a collector of Mexican American folk art, first visited Mexico in the 1960s, she had an instantaneous feeling of home. She was impressed by the rich heart of the people expressed in their art; hand-sculpted clay was her favorite medium. "The very basic essence that is clay—of the earth, of the village, of the life of the people," she said. "It is a most humble material, and yet capable of taking on so many varied and enchanting forms in the hands of the village potter." In the mid-1970s, after she had moved to Mexico with her second husband, Glenn, Janice met a young woman named Josefina Aguilar, an artist from Ocotlán de Morelos, Oaxaca, in southeastern Mexico. The Aguilar family is famous for its figurines made of clay. When Josefina and Janice met, the artist was crouching on the pressed dirt floor of her home sculpting figurines from clay found in her native village. Hatfield immediately saw similarities between the artist and herself. They were both from farming families. Though Hatfield was from the Midwest, she understood how, in the off-season, women would have to find something to occupy themselves. For Hatfield, her mother, and her grandmother, it was knitting and crocheting; for the women of the Aguilar family, it was creating figurines made of clay. Hatfield recently donated a number of exquisite figurines created by Aguilar to the National Museum of American History. "The art reflects both the life of Janice Hatfield, an American woman from the Midwest who made a home in Mexico, and the life of Josefina Aguilar, whose art transcends borders and relates to people across the U.S.-Mexico borderlands," curator Margaret Salazar-Porzio said. Aguilar often depicts everyday people, religious iconography, and Mexican folk stories. One of my favorites is Aguilar's depiction of the biblical story of the Last Supper. The scene comprises Jesus and his 12 disciples seated around a table. 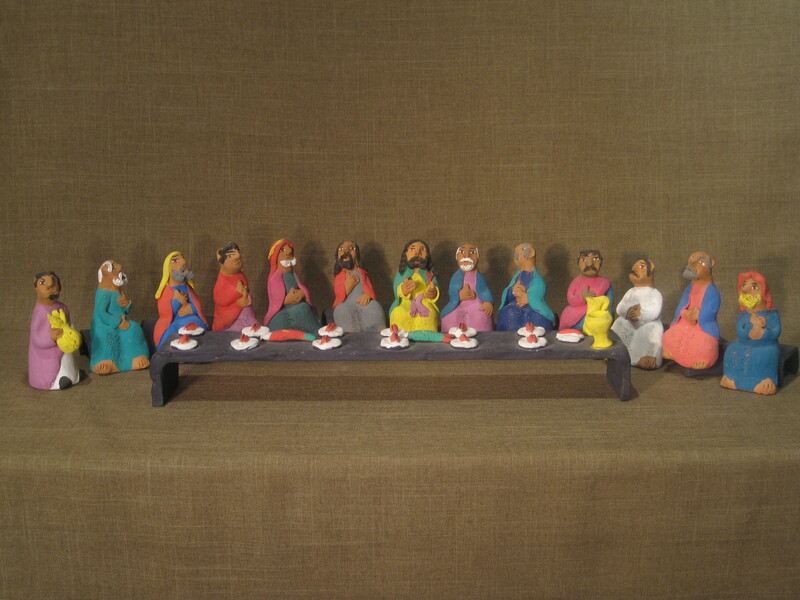 The set includes handcrafted figures, table, chairs, food, and plates on the table. Aguilar presents the scene at just the moment in which Jesus tells his followers that one among them will betray him. The disciples have shocked looks on their faces. Judas stands at the end of the table—holding, presumably, a bag with 30 pieces of silver, payment for his betrayal of Jesus. The artist depicts Judas with narrow eyes and eyebrows slanted inward to reveal his evil intentions. Hatfield purchased this set in 1976 at Víctor Artes Populares Mexicanas, one of the oldest and longest-lasting shops for Mexican folk art in Mexico City. When she first saw it in a glass display case at Víctor's, she was drawn to the diverse emotions reflected on the different figurines. Together, the pieces reflected a range of human emotions often difficult to display in this particular clay medium. Another favorite of mine is a set acquired for the museum that consists of four figurines: a woman wearing a large likeness of the Virgin of Guadalupe, a woman going to market holding a jug and balancing a basket on her head, a woman with a turkey placed on her head, and a man selling balloons. 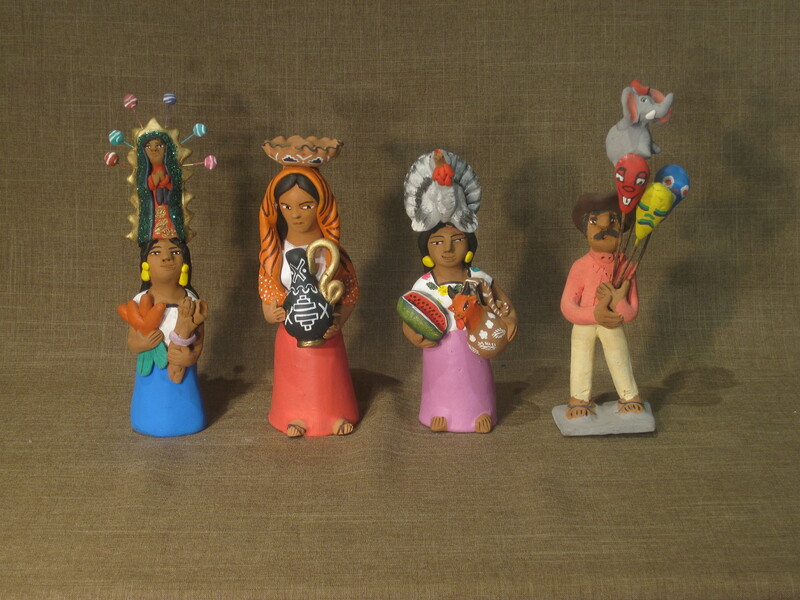 Each figure shows a unique aspect of Mexican culture and tradition. The Virgin of Guadalupe is a particularly powerful representation, one used to claim "Latina power within the Catholic religion," to borrow the apt description of David Leonard and Carmen Lugo-Lugo in Latino History and Culture: An Encyclopedia. The other figures represent the importance of local open-air markets to everyday life in the U.S.-Mexico borderlands. Hatfield spent years purchasing and enjoying folk art on both sides of the border. Her story demonstrates that the U.S.-Mexico boundary can be more fluid for some than we might imagine. The region is connected by people, history, and an ever-flowing exchange of culture. Sarah Barton completed a summer 2017 internship in the Division of Home and Community Life, working with the collection. She is a graduate of Texas Tech University and currently a student in The George Washington University Museum Studies master's program. More of Hatfield's pieces are now part of the museum's permanent collection. Many are currently on view in special cases just added to the our exhibition American Stories.